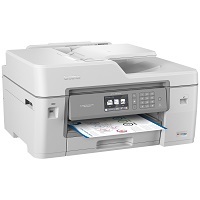 The Brother MFC-J6545DW XL Extended Print INKvestment Tank color inkjet all-in-one printer delivers reliable performance, enhanced productivity and professional results perfect for small businesses and home offices. The MFC-J6545DW XL features reengineered INKvestment Tank cartridges that work with an internal ink storage tank to deliver uninterrupted printing for up to 2-years‡ without the need to purchase ink. Versatile paper handling increases productivity. Print, copy, scan and fax up to 11"x17". The 250-sheet capacity paper tray accepts up to 11"x17" paper, plus a ledger-size scan glass. An up to 100-sheet multi-purpose tray delivers added capacity and lets you print on envelopes, cardstock and other media for diverse printing needs.